Fat and Happy Food Blog Tips and Techniques: If you are really pressed for time, arrange the meat, cheese and apple on a pretty platter, sprinkle with herbs and then drizzle with a little olive oil. The herbs and olive oil elevate a seemingly ordinary appetizer to an inviting one. This is a loose recipe- mix and match with your favorite meats and cheeses. Cube the cheese. Slice the meat into strips or cube, depending on how thick it is. Now compile the skewers. Start with the meat, if you cut this into strips, fold the strip and put on the toothpick. Then stick a cheese cube and an apple cube. Place on a platter and repeat until the platter is full. 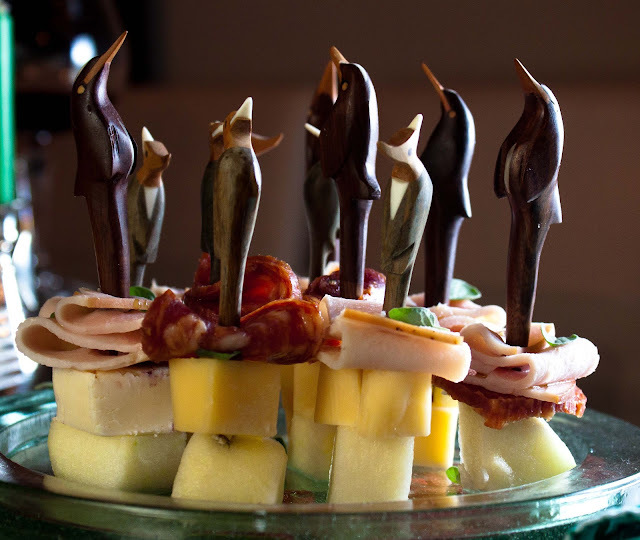 Drizzle the skewers with olive you, getting a few drops on each. Then sprinkle with the fresh herbs. Separate and wash the endive leaves, leave on a towel to dry while you mix the filling. Lightly toast the walnuts over low heat (this step can be skipped if you are short on time. Chop the walnuts and the radishes relatively fine. Place on a plate with the goat cheese and one tablespoon of thyme. Use a fork to mash the filling together. The filling is easier to work with when the cheese is room temperature; if needed, pop the plate in the microwave for 15 seconds. Using a knive, place a scoop of the goat cheese filling onto each endive leaf and arrange on a large platter. Sprinkle the platters with the remaining fresh thyme. 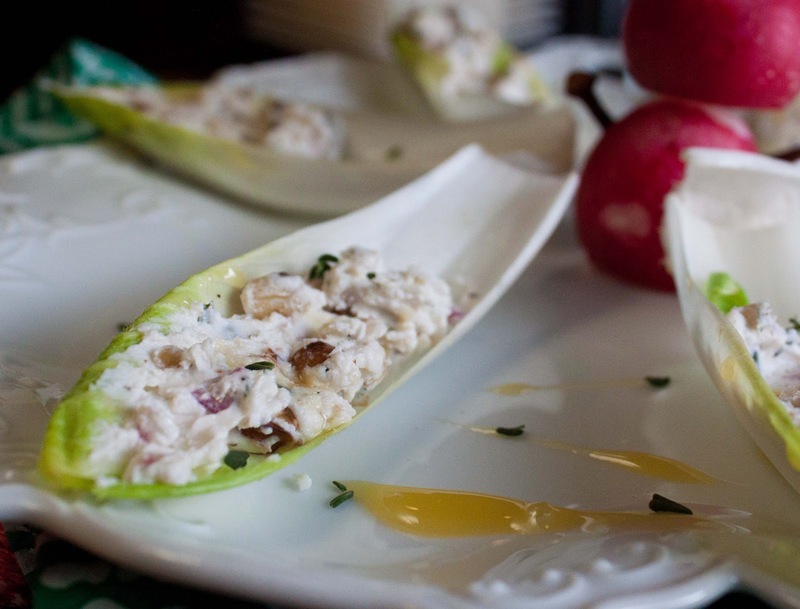 Drizzle the stuffed endive and platter with honey. Optional- warm the quince spread for 30 seconds in the microwave. 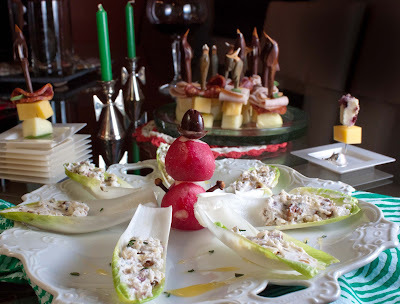 Drizzle over the endive and platter. For additional effect, make two platters and drizzle one platter with honey and one with quince. Slice to bottom of one radish so that it will sit evenly. Use half a toothpick to secure the second radish on top of the bottom one. Stick a clove in each side of the top radish for arms. 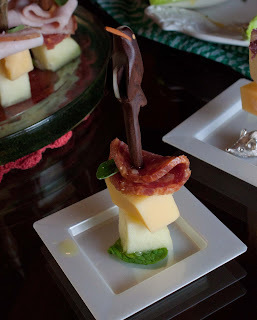 Cut the olive in half to make a hat- secure with the other half of the toothpick.